ASAP undertook a project for Médecins Sans Frontières (MSF) to conduct a market assessment of HIV diagnostics. The primary focus was on HIV viral load tests (VLT), including point-of-care (PoC) diagnostics. Issues regarding early-infant diagnostics (EID) of HIV were also considered, alongside the link between VLT and CD4 tests. This community-based market assessment was funded by UNITAID. The team undertook extensive research to scan the current landscape, and refine the scope of the enquiry, to identify countries for field visits and to develop the research. This ensured that the enquiries being undertaken by ASAP would not duplicate work already underway through other UNITAID supported projects (notably by Clinton Health Access Initiative – CHAI) and to identify core questions that could inform the interviews. ASAP’s work for MSF eventually focused on five countries: India, Kenya, Malawi, South Africa and Zimbabwe. The ASAP team worked collaboratively with a local associate in each country. Interviews were arranged with in-county MSF teams and a broad range of stakeholders including government, technical partners, health providers, civil society and networks of people living with HIV. The interviews gathered information  on issues associated with HIV diagnostics, including technologies, pricing, planning, access and availability and additional information based on specific expertise and interests of these groups. Respondents were also encouraged to discuss issues and areas associated with HIV programming more broadly if they believed them to be relevant to ongoing or future efforts to scale-up VLT and otherwise improve the quality of HIV treatment. 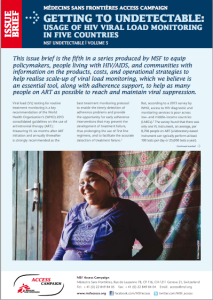 A snapshot was developed for the five study countries and offers a useful illustration of the opportunities and challenges associated with scaling up access to routine viral load monitoring for people on antiretroviral therapy around the world. Documents relating to this piece of work can be found here.